With four children at different educational crossroads, I am fascinated by how wireless technology is transforming teaching and learning. From our preschooler who expertly navigates through early learning apps, to our middle school daughters who rely on their smart device to track assignments at home, and collaborate on group projects on Google Drive in class, today's students are astute, digital natives. Our nation's community of learners has enthusiastically embraced mobile technologies as an onramp to untold blended educational opportunities and enhanced learning environments. 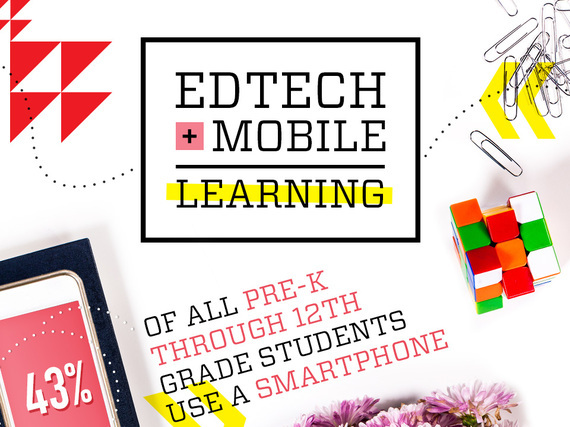 Mobile Future's new infographic - EdTech + Mobile = Learning - showcases just how essential mobile devices have become in education and the tremendous promise wireless technologies offer both students, parents, caregivers, and educators. With wireless devices now front and center in the American consciousness - the United States today boasts more mobile devices than people. So it is no surprise that more than 80% of teachers believe mobile devices enrich classroom education. Over 70% of middle and high school teachers now use cellphones for classroom activities, and six out of 10 teachers say that mobile devices allow them to provide more personalized help to students. And parental and caregiver support of digital learning tracks teacher support - 71% of K-12 parents want mobile technology used in learning. Clearly, the education paradigm has shifted. Wireless technologies today are offering students - and the teachers who instruct them - fresh, and constantly evolving ways of learning about, and experiencing, the world around them. The educational outcomes are significant, with 78% of Algebra 1 students using a tablet scoring at least proficient compared to 59% of those using textbooks. And, the financial outcome for schools is substantial, too, with schools saving up to $1,000 per student per year, when digital textbooks replace traditional textbooks. Educational innovators also understand the future of learning is mobile. Tech pioneers are investing time and capital to pursue this unprecedented opportunity to transform education in this country and indeed the world. This year more than 750 million educational apps for mobile devices will be installed worldwide. In fact, educational apps are the second largest category in Apple's App Store and the third largest in Android's Google Play. Investors, too, recognize the potential: Education technology startups attracted $1.25 billion in funding in 2013. This year, Ed Tech companies attracted nearly half that amount - $559 million - during the first quarter alone. The possibilities, like everything in the wireless space, are endless. But those possibilities could be DOA if government - in Washington, at the State House, and in our local school districts, turn their backs on the common-sense, flexible, and restrained approach to regulation that so far has powered the open and dynamic Internet we all enjoy today, protecting online freedom and speeding innovation. The 55 million U.S. students in grades K-12, and their parents and teachers, need a policy framework that supports the ongoing flexibility and ingenuity that allows U.S. wireless networks to work for them, so every one of those students can access digital learning opportunities. While I can't tell you what the future holds for mobile education, I can say with certainty (and apologies to my grade school grammar teachers) that we ain't seen nothin' yet. With policies that safeguard continued investment and innovation in wireless, we will transform American education and ensure all of our young people have the tools they need to succeed in tomorrow's wireless world. Mobile Future Chair Jonathan Spalter, a technology executive and former senior federal government national security official, leads a coalition of technology companies/stakeholders dedicated to increasing investment and innovation in the burgeoning U.S. wireless sector.